Exposure to airborne particulate matter (PM) has been shown to consistently correlate with pulmonary and cardiovascular disease. These studies have relied on fixed-site regional monitors of particulate matter and provide little to no information on causative mechanisms. Furthermore, particulate matter exposure varies greatly according to each individual's specific activities, even when they live in the same area or even the same house. 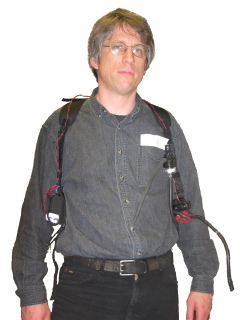 Urgently needed are studies using personal PM monitors that are carried by individuals: the "gold standard" approach for understanding what people are being exposed to via the inhalation pathway. (See Figure 1 below for an example of personal PM monitoring data.) Yet these personal samplers require daily battery changes, and have been bulky, noisy, expensive, and "dumb", i.e. providing information only averaged over days of an individual's many activities. Thus for epidemiology to offer further insights into the influence and health effects of important PM sources, new exposure assessment methods are needed that take advantage of recent technological advances to collect and analyze spatial and temporal data. I currently lead a multi-institutional team that is developing new, miniaturized personal monitors that will measure certain types of pollutants in near-real-time (every few minutes) as well as bring back particulate matter samples for additional laboratory analyses. One important class of particulates of potential health concern is black carbon. Black carbon is a byproduct of incomplete combustion of organic matter and can be an important constituent of particulates in settings such as urban centers or in indoor air from unvented biomass burning. 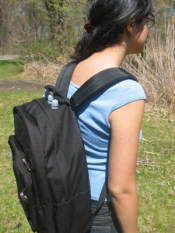 The overall goal of the proposed study is to develop and test a new miniature "smart" personal sampling system that will 1) record levels of BC and another air pollutant in near-real-time, 2) collect and archive time and space resolved PM samples for later laboratory analyses , and 3) record location and activity data. The unit will be designed to be very flexible in how it is set up and used, allowing it to be integral to very different study designs. Distribution of airborne Fe in subsets of personal samples, home outdoor samples, and home indoor samples collected in winter and summer field seasons. The personal samples were broken into three subsets: (1) for students that had identified that they had ridden the subway; (2) for students for which we did not have the information (e.g., lost or incompletely filled out); (3) for students reported that they had not ridden the subway. The number of measurements in each category is given in the x-axis labels. The solid line represents the median, the red dashed line represents the average, the tips and tails represent the 5th and 95th percentile concentrations, and the box top and bottom represent the 75th and 25th percentile concentrations. Chillrud, S.N, D. Epstein, J. Ross, S. Ramstrom, D. Pederson, J.D. Spengler, and P. L. Kinney (2004). Elevated airborne exposures to manganese, chromium and iron of teenagers from steel dust and New York City's subway system. Environ. Sci. Tech., 38:732-737.
responding to the needs of the Community Outreach and Education Core (COEC) and local community ograniziations in a number of ways, including testifying in public hearings and carrying out pilot field work to test whether perceived sources of air pollution exist and can be documented. Chillrud, S.N., J.M. Ross, A. Morris, D. Pederson, M. Aggarwal, S. Ramstrom, J.D. Spengler, and P.L. Kinney (2000) Filter reflectance as a tracer for the outdoor contribution to indoor fine particle concentration: results from the New York City TEACH Study. In "Engineering Solutions to Indoor Air Quality Problems: Proceedings of a Symposium, July 17-19, 2000, Raleigh, NC, p. 130 -139. Kinney, P.L., S.N. Chillrud, S. Ramstrom, J. Ross, and J.D. Spengler (2002) Exposures to Multiple Air Toxics in New York City. Environmental Health Perspectives 110(4): 539-546. Ramstrom, S, J.D. Spengler, S. Chillrud and P. Kinney (2002) Seasonal variations in indoor and outdoor concentrations of VOCs in New York City. Proceedings of Indoor Air 2002, Distributed as CD-ROM to conference attendees. Landrigan, P.J., P.J.. Lioy, G. Thurston, G. Berkowitz, L.C. Chen, S.N. Chillrud, S. H. Gavett, P. G. Georgopoulos, A. S. Geyh, S. Levin, F. Perera, S. M. Rappaport, C. Small, and the NIEHS World Trade Center Working Group (2004) Health and Environmental consequences of the World Trade Center Disaster. Environ. Health Persp, 112:731-739. Sax, S., D.H. Bennet, S.N. Chillrud, P.L. Kinney, J.D. Spengler (2004) Differences in source emission rates of volatile organic compounds in inner city residences of New York City and Los Angeles. 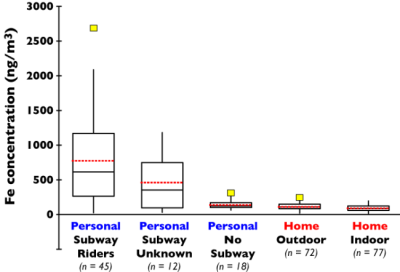 Journal of Exposure Analysis and Environmental Epidemiology, 14: S95-S109. Chillrud, S. N., G. Hemming, J. Ross, S. Wallace, and N. LoIacono (2005) Determination of lead isotopes in blood with separation by iron hydroxide co-precipitation and analysis by multi-collector ICP-MS, Applied Geochemistry 20: 807-813. Chillrud SN, Grass D, Ross J, Coulibaly D. et al. (2005) Steel dust in the New York City subway system as a source of manganese, chromium and iron exposures for transit workers. J Urban Health 82: 33-42. Sax, S.N., D.H. Bennett, S.N. Chillrud, J. Ross, P. Kinney, J.D. Spengler (2006) A cancer risk assessment of inner-city teenagers living in New York City and Los Angeles. Environmental Health Perspectives, 114(10):1558-1566. Breysse PN, Williams DL, Herbstman JB, Symons JM, Chillrud SN, Ross J, Henshaw S, Rees K, Watson M, Geyh AS. (2005) "Asbestos Exposures to Truck Drivers During World Trade Center Clean Up Operations" J. Occ. Environ. Hygiene, 2:400-405.
deCastro, B.R, S.N. Sax, S.N. Chillrud, P.L. Kinney, and J.D. Spengler (2007) Modeling time-location patterns of inner-city high school students in New York and Los Angeles using a longitudinal approach with generalized estimating equations. J. Exposure Sci. & Environ. Epidemiology, 17(3): 233-247.